What about an North Korean Airline set? Spriting airplanes is extremely difficult so I don't think I will. At least two new station buildings and of course a cute little signalling box waypoint, as all waypoints should be. 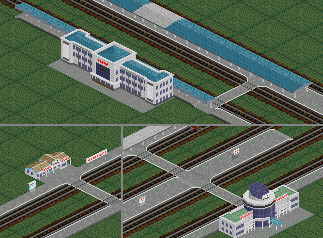 Also Kwangok station will be available as a 1x2 tile station. For the moment I just very quickly threw something together just to play with the trains and the stations and such (using the Japanese signals set and the Japanese towns and roads sets... the signals are fine since they did use Japanese-style semaphores, but I'd love to see some more Korean/DPRK buildings (is there a Soviet bloc building set...?)... anyways I'd like to make a couple of observations/questions, if I may? First one... okay, haven't seen all the the locomotives etc in play yet, but the running costs seem rather high? Second one is really just a nitpick, re the 6000 srs steamers: maybe could make some different ones to reflect the different types that were used, 6100 = pre-war Mikai, 6200 = pre-war Mikani, 6300 = pre-war Mikasa... in any event though the vast majority of the 6xxx steamers were built in Japan, not China. Are you planning on adding other steamers, too? Third - if you want to add more freight cars, I've compiled a bunch of info on those, too, especially boxcars and open wagons, some covered hoppers for grain, brake vans, etc. (including photos). I have this one (1.2) installed, but just noticed that the standard passenger wagon always gives the same sprite? I'm glad to hear you like my grfs. I have a few things planned for existing newgrfs, mostly related to reskinning things. Variable running costs changes the running cost of coal and diesel based on the year, modelled after the change in coal and oil prices. Second: I do not plan on adding other steamers, as they are very hard to make. Third: Yeah I couldn't really find anything on freight cars, so if you could DM that information to me, I could take a look and see what I can do. Fourth: I'll see what I can do. I have not been able to reproduce this bug. There are 3 types of carriages, the distribution of which should be: 4:3:1. It's inspired me! 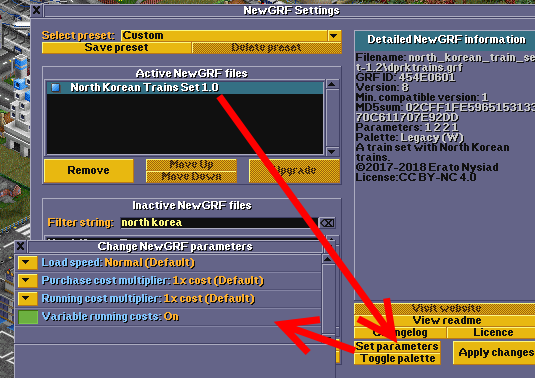 I made a new Town Name grf with nearly all of the populated areas in NK that have rail service, I'm also trying to learn how to do the things related to building a scenario using heightmaps, and eventually I want to learn doing graphics stuff, too... like for track, later bridges, etc... but the map is my first project. I jumped the gun a little with that comment... now that I've played it more extensively, I'd change my observation to saying that the running costs of the Keha and the DeRoHaNi (etc) are rather high; they're sorta too small to run alone, but to run a train of them gets really expensive. In the Japan set (which is the only one I've played before this), you can make EMUs and DMUs longer by adding passenger cars, which then appear as cars appropriate to the trainset in particular... but I imagine that's not a really simple thing to do? Okay. Maybe I'll look into seeing if it's a difficult thing to export a single locomotive from one set and import it into another set... so then if there's say a USATC S160 or a Soviet Ye class (they used lots of both of those!) or whatever, then I could at least add them to my own game/scenario. I'll put something representative together and send it your way; I'll try to include some cars suitable for each cargo type and something old and something more modern. I'll include some brake van stuff for you, too. Ooh, now you have me intrigued! If I could make an observation/recommendation? An Immortality Column is essential, every town and village has one! Ohhh, okay! Then looking now, I see that there's no bug at all! Those all show up just fine. I thought you were referring to different liveries - 2 or 3 years ago now, KJU issued a directive to modernise the appearance and operation of the railways, so since then they've been slowly repainting passenger equipment into new liveries, I've seen three variants so far - white with red window band, white with blue window band, and white with green window band... maybe these could be added as a future arrival? Like say have these show up at random from 2015 (like how in the Japan set at some point the Passenger Car and Mail Car change from brown to blue when you buy new ones). Please don't take anything I say as demands or expectations... just excited wishes and suggestions and ideas! * DFH - for consistency's sake with the other types, this should be named "KSR 900 Series (Diesel)"
* "KSR 100 Series (Diesel)" - The start year for these is 1976 in the game, but they were first built for China Railways in 1984, and the first ones for NK were delivered around 2000. * "KSR 300 Series (Diesel)" - max speed in the game is 120 km/h; should be 100 km/h. * "KSR 400 Series (Diesel)" - start year in the game is 1989, but these were delivered to NK in 2004. They are also all in a unique purple/green/yellow livery - I can send you pics if you like. * "KSR 500 Series (Diesel)" - start year in the game is 1968, but the first deliveries to NK were in 1972. * "K62 Class (Diesel)" - start year in the game is 1974, but should be 1967. Also, most of these have the 'standard' blue over green livery; the overall green scheme you put on the sprite is found only on the V200/ST44 bought second hand from Germany, Slovakia, Russia, and Poland from 1989 on (as 700 and 800 series). * "KSR 5200 Series Red Flag 2 (Electric)" - a fair number of these were built as "Mangyongdae Class", with a cream over red livery, and geared for 140 km/h for fast passenger trains; if you don't want to make a new sprite for this, maybe you could just change the max speed to reflect this, and to give some variety? Sorry if I'm throwing too much at you at once, but I'm really quite excited about this! I saw. It's nice to have a GRF with more real town names. As for the scenario: I'm looking forward to it. If you want, I have some experience with making heightmaps from satellite data. If you have any requests for DPRK Stations (granted, I'd need pictures), I'm all ears. I'd change my observation to saying that the running costs of the Keha and the DeRoHaNi (etc) are rather high; they're sorta too small to run alone, but to run a train of them gets really expensive. It's rather trivial to be honest, but when I made the MUs, I ran a poll in an OpenTTD chat group I'm in, and they unanimously voted for just having set consists. It's not hard to implement either way, I might add a parameter for it as I did for RIMS. Just send it. I'll see what I can do. I thought you were referring to different liveries - 2 or 3 years ago now, KJU issued a directive to modernise the appearance and operation of the railways, so since then they've been slowly repainting passenger equipment into new liveries, I've seen three variants so far - white with red window band, white with blue window band, and white with green window band... maybe these could be added as a future arrival? Like say have these show up at random from 2015 (like how in the Japan set at some point the Passenger Car and Mail Car change from brown to blue when you buy new ones). I see. This is the first time I'm hearing of this. If you have pictures of this, please do send them my way. I'll see what I can do. Please do send pics. As for the rest; Noted. Don't worry. It's been a while since I had someone this invested in my work. I like it. I might not have time to work on a lot of it though, seeing as exams are coming up, but I can certainly work on it when exams are done. As for the scenario: I'm looking forward to it. If you want, I have some experience with making heightmaps from satellite data. This is the area I want to do; using the line measurement in Google Earth, the area inside the lines is 102 x 102 km - which, counting 10 grid squares per kilometre (since two passenger cars fit inside a square, and assuming a standard passenger car length of 21.5 metres, seems a reasonable assumption), fits nicely on a 1024 x 1024 map. I think this is a good size, big enough to be interesting and challenging, but small enough to be manageable. I chose this area for a number of reasons - primarily because it's the most diverse in terms of industries in North Korea. This is the primary agricultural area of the DPRK, so there's plenty of Farms we can place on the map; there are quite a few iron mines in this region, as well as other mineral mines (that we can represent as iron mines using vanilla economy), and there are major smelters and steelworks near Nampo and Songrim; there are chemical plants and refineries (which can be represented in vanilla econ with oil refineries), and I'm thinking to use an oil rig for Nampo Port to represent oil arriving by sea, and oil wells at other spots to represent mines etc that deliver to chemical plants... there's also some (but not much) lumbering that happens inside this region, as well as some coal mining... so I think in terms of the vanilla industry, this is the most interesting region from a gameplay perspective. The 8 km section of the Pupo Line from Singangryong on the Ongjin Line to Kangryong. My basic idea for the scenario is to set it up such that the player starts on 1 January 1953, with some bits of infrastructure and some equipment already in existence, but a great deal of it destroyed, using FooBar's Useless Tracks GRF for this. If you have any requests for DPRK Stations (granted, I'd need pictures), I'm all ears. Not a rush at all, I'll have plenty to do myself, too, sorting through my info etc, and especially learning things before I tackle the actual scenario... especially since I'll need the "final" GRFs to build it without having to worry about problems from trying to add new ones to the scenario? Can you make two new station tiles? 2 - the square inside the red outline: crossings to connect platforms to each other across "invisible platforms"; I know for sure I'd need such a crossing like the one in the picture, as well as for a concrete-type overpass... don't yet know if I'll need it for the metal type, but it's possible. 2: DPRK Stations has waypoints for all crossings. I'd have another request... cargo trucks that are available from 1945, for coal, wood, etc? The type doesn't matter really but if we want to get specific about that, the ZIS-150 was one of the most common types around after the war.